Scott earned a Bachelor's of science degree from Johnson & Wales University in marketing. After school he spent seven years in the family automobile business before starting in the mortgage industry in 2001. Scott truly embraces the concept of customer interaction. To quote Jerry Maguire, Scott is the "king of the living room". Once you talk to Scott, you truly are a client for life. It is this desire to know the client on a personal level that is the secret to his success. In addition to originating new business, Scott also has taken on internal responsibilities as well. His help in our In-House Lending and closing department are invaluable. Scott is a Native of the Washington, D.C. area and is an active member of BNI (Business networking International). He loves the quick excursion to Atlantic City with his wife or simply taking his two kids to the park. For the first time in more than four years, the Federal Reserve cut its Fed Funds Rate, which directly impacts millions of American borrowers. The federal funds rate is what banks charge each other for short-term loans, while the discount rate is what the Fed charges for loans to banks. Borrowers waiting for a lower fixed-rate mortgage may be waiting for a long time. Fed Funds Rate cuts do not translate into cuts in fixed-rate mortgages. In January 2001, the Fed Funds Rate was at 6% and 30-year fixed rates averaged 7.03%. By December 2001, following 4.25% in cuts throughout the year, home loan rates were actually up to 7.07%. Yes, we may experience some temporary improvements in rates in the coming weeks, but the markets will remain volatile as long as inflation and recession are a possible threat to the Federal Reserve's long-term economic policies. The fixed rate actually increased slightly the day after the rate cut. The Federal Reserve meets again in six weeks, and no one is certain how market volatility and inflation concerns will affect their future policy and decision-making. Bottom line: Take advantage of this opportunity while you still can. If you’re looking to capture a lower interest rate for refinancing or buying a home, this could be your best opportunity to do so. If you are near your 36th or 60th month of your ARM, please talk with us about your options so we can help you before your rate goes up. Now is a great time to refinance into a fixed-rate loan, regardless if you're near the end of your ARM's fixed term or not. We will be happy to show you detailed fixed rate and adjustable rate scenarios for your new loan. If you have a Home Equity Line of Credit (HELOC) or credit cards tied to the Prime Rate, the Fed’s cut in the Fed Funds Rate just put a little money in your pocket. The Prime rate is currently 7.75%. Is it smart to put no money down when I purchase? ARM's are coming due. Should I refinance? Should I invest in real estate? Shoot me an email so I may include you in my weekly emailing. You will receive the below update of the current market, with mortgage rates and my commentary. If you’re thinking about taking out a home improvement loan, there are several options to consider. First and foremost, as your Loan Officer I need to know why you want the loan. Here are some factors to take into consideration. Will the improvements increase the property value? Are you making improvements to increase energy efficiency? Will improvements be made in one fell swoop, or in stages? What is the appraised value of the home? What improvements will be tax deductible? Do you have other revolving debt that you would like to pay off at the same time? Are you making improvements because you plan to sell the property? Buyers of newly-built homes are often tapped out after making the initial down payment and closing costs, including upgrades to amenities and the inevitable need for new furniture. Shortly thereafter, they many times realize they’d like to make additional improvements to really have the home of their dreams. Landscaping may also be in order. The developer may have been kind enough to make the front yard a perky green, but if the back yard is a disturbing brown color sparse with weeds, you may be entertaining the vision of a pool or deck. It’s like a having a credit card with a much lower financing rate. In fact, the HELOC can be used for any reason at all – even paying off that credit card debt. In most cases, this action turns that revolving debt payment into a tax deductible payment with a lower interest rate. The HELOC is generally a 2nd Trust Deed, unless it is used to pay off and replace the 1st Trust Deed. A construction loan is an alternative to the HELOC for borrowers who don’t want to use or don’t have equity, and this type of financing can be used for construction on an existing dwelling. The lender will ask a lot more questions about what the borrower wants to do with the money, and the home owner will need architectural designs, permits and a licensed general contractor on board. Another option – depending on the value of your home and local loan amount limitations – is the FHA 203(k) Program. This financing is designed for the purchase or refinance and rehabilitation of properties that meet FHA guidelines, and many times is capped at $35,000 for improvements. This is worth looking into if you need to bring a property up to compliance standards, finance eligible energy efficient improvements, or turn a single-family owner occupied dwelling into a duplex. If you want to sell your home and you simply want to improve the curb appeal, it makes sense to go with a HELOC. Make sure you are aware of the current market value of homes in your area to make sure you’re not going over the limit on the fair market value of your home. You’ll want to get a return on your investment. If you’ve had your home on the market too long and have not been able to sell, you might want to make some changes to give it a fresh new look and bring back the passion you once had for your home. I will help you weigh out your options for financing based on your outstanding mortgage balance, income and credit scores. Unfulfilled promises to pay bills, the maxing out of credit cards, and a total breakdown in communication frequently lead to the annihilation of at least one spouse’s credit. Depending upon how finances are structured, it can sometimes have a negative impact on both parties. By taking a proactive approach and creating a specific plan to maintain one’s credit status, anyone can ensure that “starting over” doesn’t have to mean rebuilding credit. The first step for anyone going through a divorce is to obtain a copy of your credit report from the 3 major agencies: Equifax, Experian, and TransUnion. It’s impossible to formulate a plan without having a complete understanding of the situation, and your fico scores. Create a spreadsheet, and list all of the accounts that are currently open. For each entry, fill in columns with the following information: creditor name, contact number, the account number, type of account (e.g. credit card, car loan, etc. ), account status (e.g. current, past due), account balance, minimum monthly payment amount, and who is vested in the account (joint/individual/authorized signer). When it comes to a secured account, your best option is to sell the asset. This way the loan is paid off and your name is no longer attached. The next best option is to refinance the loan. In other words, one spouse buys out the other's equity. This only works, however, if the purchasing spouse can qualify for a loan by themselves and can assume payments on their own. Your last option is to keep your name on the loan. This is the most risky option because if you’re not the one making the payment, your credit is truly vulnerable. If you decide to keep your name on the loan, make sure your name is also kept on the title. The worst case scenario is being stuck paying for something that you do not legally own. In the case of a mortgage, I will be happy to review your existing home loan along with the equity you’ve built up and help you to determine the best course of action. Evenly distribute your credit card debt to change the ratio of debt to available credit. Let's say you have a credit score of 665. If you have debt on only one card, and four additional credit cards with zero balances, evenly distributing the debt of the first card could move you closer, and possibly into, that ideal bracket. Keep credit inquiries to a minimum. Each inquiry into your credit history can impact your score anywhere from 2-10 points. When it comes to mortgage and auto loans, even though you're only looking for one loan, multiple lenders may request your credit report. To compensate for this, the score counts multiple auto or mortgage inquiries in any 14-day period as just one inquiry, so try and stay within that time frame. I will be happy to guide you through the nuances of the process of improving your credit score to refinance and save money. I will need to review the terms of the existing mortgage loan to determine if you have a pre-payment penalty clause written into your loan. If you have this penalty, it may affect you if you sell the home or try to refinance before the pre-payment penalty expires, and can be as high as 3 percent of your loan. Next, we need to pull your credit, and start working on improving your scores six months prior to the expiration date on your existing pre-payment penalty. There are five factors that make up the credit score and your mortgage consultant can coach you through some basic strategies to improve your credit score. This means very conservative use of credit cards, paying off debt as much as possible and not applying for additional credit cards unless you will benefit from such action. You will want to verify that negative items you have paid off are being removed from your credit report, and that good credit history is being reported to all three bureaus. You’ll also want to dispute any errors that appear on your credit reports and seek to have those removed entirely. Once your scores are where I need to see them, it’s time to refinance at a better interest rate. If needed, I will look for a program that carries no more than a two-year prepayment penalty so you can continue to refinance as your credit score increases. We will repeat this process until you reach A-paper status and secure the best interest rate available. We can also follow this strategy if you are a first-time home-buyer who does not have enough credit history under your belt to get an A-paper loan at the time of purchase. Credit re-scoring | rapid rescore- increase scores in 72 hours! If you were to invest the $60,000 in a vehicle that can out-earn the cost of that debt, then this could be a formula for success. This is why some lending professionals suggest putting as little down as you possibly can, maximizing your tax write-off, and investing the rest. This principal has been applied for many years in the life insurance game. The old saying goes, "Buy term and invest the rest." The key component is taking the money you would have used as a down payment and creating an asset accumulation account. This account should earn a significant enough rate of return to enable you to pay your mortgage off entirely and achieve the ultimate goal of being debt-free. Regardless of how rapidly you pay your home off, you're not getting any greater rate of return on your investment than if you paid it off slowly. Over the course of time, it's been proven that your rate of return over the long-haul will be far greater than the rate you'd pay for a mortgage in today's rate environment. It's important to seek the advice of a skilled investment advisor to ensure success with this strategy. The second scenario is best for those who have a difficult time managing their money or who'll sleep easier at night knowing they have a plan in place to pay their loan off more rapidly. Be sure that your budget can handle accelerated payments. When consumers "bite off more than they can chew" with a 15-year mortgage, they frequently end up having to refinance back into a 30-year schedule. You can ALWAYS pay on your 30 year mortgage so that it will be paid-off in 15 years...ask me to print you up an ammortization schedule! If you or someone you know has an ARM, there is still time to take advantage of alternative loan programs, such as intermediate fixed-rate and tiered-rate loans, that can effectively limit one’s liability before rates increase again. These programs enable borrowers to stabilize their finances and know exactly what their monthly payments will be over the next few years while the Fed does its best to stifle inflation. Remember, the Fed has a habit of overcorrecting the market before changing policies, which means rates could still increase even after their goal of a soft landing has been reached. If you do foresee a sustained period of paying an interest rate that is significantly higher than what you want or are able to pay, talk with me today. Don’t be a casualty of the Fed’s war against inflation. Ask about our intermediate fixed-rate or tiered-rate products to hold you over until the Fed flips the script and rates finally begin to decrease. I have access to a variety of loan programs including 3, 5or 7-year fixed-rate products as well as tiered-rate programs to counter fully-indexed ARMs and Option ARMs. A 5-year fixed rate mortgage, for instance, converts to an adjustable at the end of that fixed tenure. Taking out such a loan, with no prepayment penalty, may make a lot of sense right now because it will provide some interest rate relief, while buying you time to refinance once rates begin to decrease. Tiered-rate products, on the other hand, are essentially fixed-rate loans that act like adjustable rate loans but offer the security of a built-in cap. In fact, these loans actually adjust in your favor, saving you money in the first years of the loan before reaching their final fixed rate. Various types of these tiered-rate products exist, and each offer different money-saving options. If you are looking for a rate below 6%, ARMs may be a good option for you. There are many different loan programs available when shopping for a mortgage, and the choices can seem intimidating. Most people ask for a thirty-year fixed rate mortgage, but they fail to evaluate why they want this loan. Just because the fixed rate loan is the "industry standard" doesn't mean that it meets everyone's needs in every case. Just as a stockbroker can tell you what stock picks make the most sense for your portfolio, I will help you decide what mortgage type makes the most sense for your current needs and future goals. First, let me explain the way an ARM works. When lending money, there is always a risk to the lender, and when working with mortgages, the interest rate is correlated with the risk level. There is very little risk for the borrower in a fixed rate loan, and since the lender has the most amount of risk, these loans have a comparatively high interest rate. When the interest rate can adjust with market conditions, there is slightly more risk for the borrower, and since the total risk is shared between the lender and borrower, the lender can offer a better rate. Not many people would be interested in a loan that adjusts frequently, so lenders have created loans that combine fixed and adjustable periods. Adjustable rate loans usually offer initial fixed rate periods that range from 1 to 10 years, rate adjustments only once per year, and both annual and life-time adjustment caps. An example is a 3/1 ARM where there is an initial fixed rate period of three years and one rate adjustment each year thereafter. There is a 2% annual rate adjustment cap with a maximum of 6% rate adjustment over the life of the loan. So, for the first three years of the loan, the loan is identical to a 30-year fixed rate loan, but the interest rate is lower. Each year thereafter, the rate can go up or down by a maximum of 2%. On a $100,000 loan, that equates to about $135 per month the payment can go up or down. Most ARMs are based on indices that reflect a running average of the treasury bonds, and are some of the most stable indices in the market. Since these indices are a running average, changes to the index lag significantly behind actual market changes. By keeping an eye on the market and the mortgage index, you can predict what your mortgage payment will do. If you don't like what's coming, refinance into a fixed rate until the market is more favorable. When will an ARM benefit you? Interest rates are lower than the thirty-year fixed, so if you're rate conscious, an ARM may be for you. Lower rates mean lower payments, and the monthly savings can be channeled into savings for your next home, higher education, or to pay-off other debts. If you plan on staying in your current home for five years or less, you can take advantage of the low fixed rate period and not even worry about the adjustable period of the loan. Using the low interest rate of an ARM, you may be able to qualify for a more expensive home, and as your income increases with time, you will be better able to manage the payment fluctuations or refinance into a fixed rate loan. 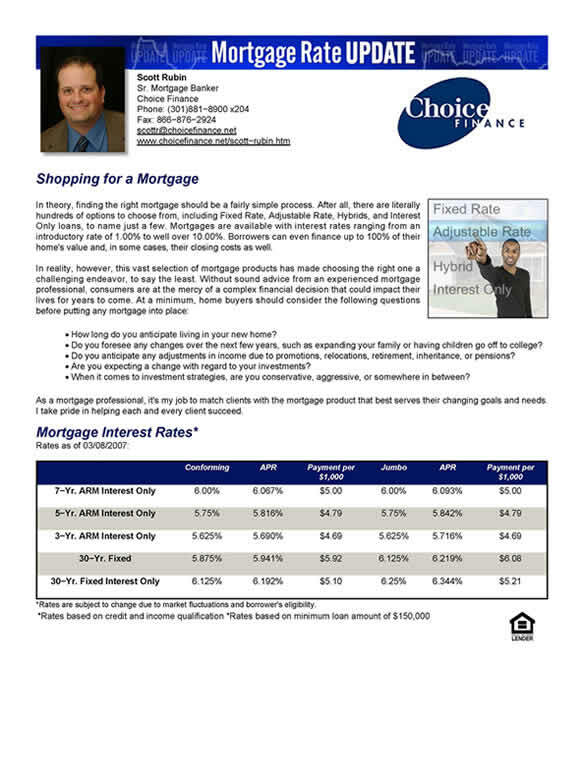 You probably either have an Adjustable Rate Mortgage (ARM) or know someone who does. Over the last few years, the number of consumers who chose an ARM in lieu of a Fixed Rate Mortgage grew to nearly two out of five people in some months, as short term interest rates were at all time lows. Concern is growing in Washington and among many mortgage lenders regarding whether those with ARMs will be able to handle the payment increase they'll experience when their loan resets to the new minimum payment required. CNBC reported last week that over $1 TRILLION in mortgages are scheduled for adjustment in 2007 alone. Are you one of the several million homeowners who will suffer this fate? Many ARM programs, particularly those with Option ARMs, offer the ability to make interest-only payments or payments that are less than the full amount of interest due each month. In these cases, the mortgage balance will either remain the same or increase with each payment a homeowner makes. According to Wall Street experts, 70% of homeowners opted to make the minimum payment required when given the option to do so. What does this mean to me? Those with ARMs that are scheduled to reset in the next 12 months could see minimum payment increases of anywhere from 50% to over 100%! According to the San Francisco Chronicle, the nation's largest lender is now alerting borrowers by letter to the potential payment shock they could soon experience. The letter reportedly explains that a borrower with a hypothetical loan amount of $402,000 and a fully indexed interest rate of 7.60%, could be making a minimum monthly payment of $1,348.47. If this loan were to be reset at today's rates, the full payment required would increase to $2,887.50. This borrower's payment would increase by more than 114%! If you have a Home Equity Line of Credit (HELOC), the interest rate in effect for this loan has increased 4.25% in the last two years, more than doubling the required payment for some homeowners. Those with a HELOC balance of $50,000 have seen their payment increase nearly $200.00 in that time frame. What should I do? Pull out your mortgage statement. Examine not only the payment requirements but also the interest rate that's currently in effect. If you have an ARM, you need to know the index and the margin. These will determine the interest rate you'll be charged when your loan is scheduled to adjust. Those with Option ARMs could see their interest rates increasing to over 8.00%. Interest Rates for Fixed Rate Mortgages are very attractive! Fixed interest rates are the lowest they have been in six months. If you were waiting for rates to dip before considering refinancing, it is seriously worth considering. One of the biggest reasons homeowners refinance their mortgage is to obtain a lower interest rate and lower monthly payments. By refinancing, the borrower pays off their existing mortgage and replaces it with a new one. This can often be accomplished with a no-points no-fees loan program, which essentially means at “no cost” to the borrower. Refinancing typically occurs when mortgage interest rates drop significantly, but borrowers with recently improved credit scores (from paying off credit card debt, making mortgage payments on time, etc.) are often candidates for better interest rates as well. If you haven’t checked your credit score in a while, give me a call. One question asked a lot is, “..why should I go back into a 30-year loan?..”. One option is to take the route of the “same payment” refinance, and actually pay off the loan faster and save money on interest fees in the long-run. If refinancing results in a lower monthly payment, the borrower can still continue making the same payment they made in the original loan, and the extra money will be applied to the principal balance. For example: Let’s say you have 25 years remaining in your current loan, and you refinance back to a 30-year loan with a slightly lower interest rate, resulting in a payment reduction of $200 per month. (Note: This is just an example. The actual amount could vary.) You could then take that extra $200 per month and apply it toward the principal on the new loan. At this rate, the loan will be paid off in 22 years and 4 months, which is 2 years and 8 months less than the original loan. Another option is to invest the extra money in a side-fund that could earn a better rate of return and grow to the amount of the mortgage (and beyond) in even less time. This method provides excellent liquidity.